No need to download apps anymore! 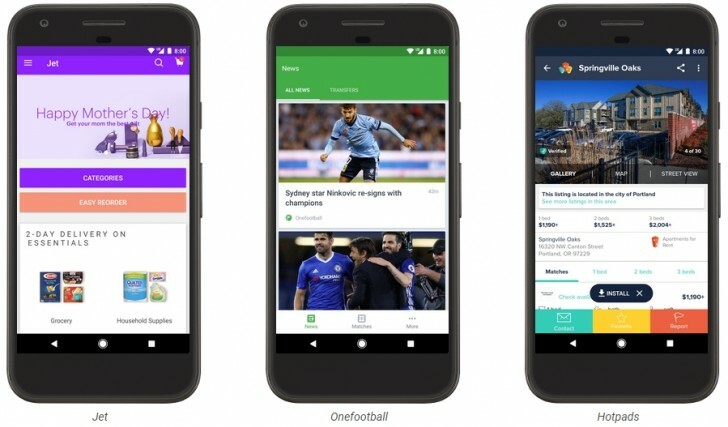 Google PlayStore is coming up with a new update after a long time; the addition of a ‘Try Now’ button for Instant Apps. Instead of downloading the app, the app launches automatically to see parts of it in action. In order to see this clean demonstration of the Instant Apps technology, you need a recent Android OS atleast above 5.0. However, this feature might be varying from market to market. I just tried it from my device but all I got to see was the old ‘Install’ button. Since this is only the start, it will spread to other markets slowly. The whole idea is to ‘stream’ Android apps before downloading to see how the app feels like. Also, Google is experimenting with a flexible design model where user will be shown only parts of the applications which is relevant to his/her current activity. Instant apps will actually help link the line between efficient apps and interactive content in the web. In the future, no one actually needs to download an app but just click an URL from a search result, messaging or a link itself and take him/her to the native Android app envrionment without even installing it. Just imagine just clicking a high end game like Modern Combat and instantly start a multiplayer death-match game without even installing the app and then downloading additional files. This sure is a good update from PlayStore after a long time and holds great promise. Just like how instant articles have been helping us read articles by going to the page in miliseconds, Instant Apps will be a huge game-changer as well.